Once the leaves begin to fall, it can only mean one thing: autumn is here! As soon as this colorful season begins to creep up on you, it is time to start planning out your holiday party menus. 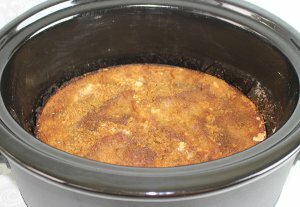 From Halloween to Thanksgiving to Christmas food, AllFreeSlowCookerRecipes.com is your one-stop guide to easy and delicious holiday recipes. 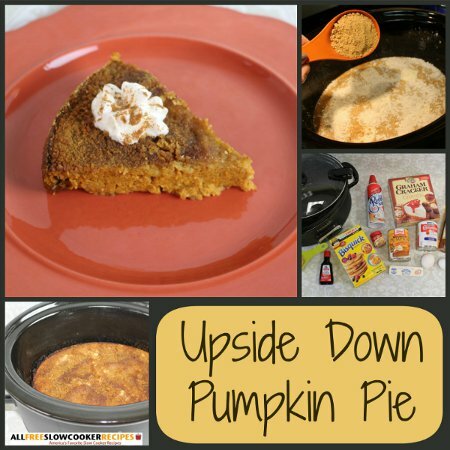 Upside Down Pumpkin Pie is a delightfully simple pie recipe that is a must-make for this year’s Thanksgiving or Christmas. 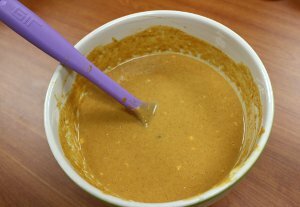 The best part about this homemade pumpkin pie recipe is that it is cooked right in your slow cooker. Making this Thanksgiving dessert in your slow cooker frees up your oven space for side dishes or the all-important turkey that needs cooking. The easy pumpkin pie recipe has a crumble crust on top of it, so you can scratch “making pie crust” off your to-do list. Try serving this Upside Down Pumpkin Pie in triangular slices, or scoop it out of the slow cooker into bowls if you just can’t wait to dig in. A dollop of whipped cream and a sprinkle of cinnamon on top adds the perfect finishing touch. 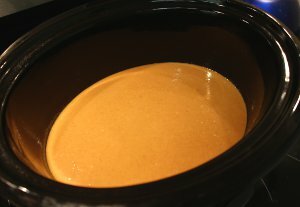 Even the pumpkin pie skeptics in your family are sure to be converted with this homemade slow cooker recipe. 1. 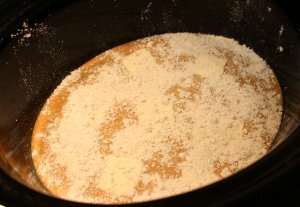 In a large mixing bowl, mix together pumpkin, evaporated milk, rum, brown sugar, one-third of the Bisquick, eggs, vanilla and pimpkin pie spice. Stir until combined. 2. 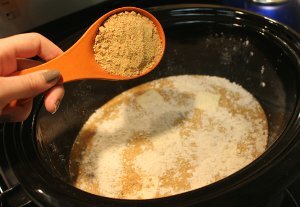 Grease the slow cooker with non-stick cooking spray. 3. 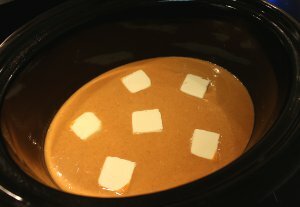 Pour the liquid mixture into the slow cooker. 4. Place pats of butter on top of the liquid mixture. 5. Sprinkle remaining Bisquick on top of the butter. 6. 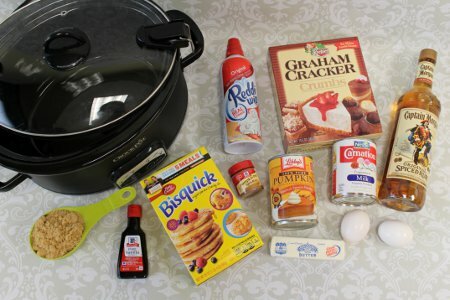 Sprinkle the graham cracker crumbs on top of the Bisquick. 7. Cook the Upside Down Pumpkin Pie on LOW for 7 hours or on HIGH for 3 1/2 hours (until mixture has thickened and crust becomes golden brown). 8. Top the pie with a dollop of whipped cream and a dash of cinnamon. 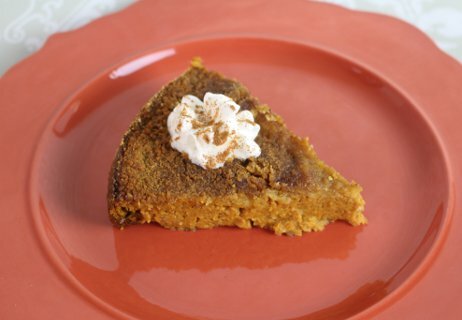 I have never made pumpkin pie or a pumpkin recipe with rum before, so I am definitely ready to make this dish. I want to see what it tastes like with rum in it. I like that you can use this recipe for the holidays too because who does not need a fun and easy recipe to make so that you can visit with your guests and serve them something tasty.